Back when they first started, there was a debate over what the point of litfests in Pakistan was. They seemed elitist and unimaginative and much more. To be fair, at first none of those attending seemed to know either, but over time the combination of free-to-enter public spaces catering to something other than food or religion (though both would be present) meant that these events seemed to generate their own gravitational pull, attracting attendees and sponsors alike. One thing that has been common to all these literary fests, regardless of which city or season they have been held in in Pakistan, is that there are two boxoffice acts – Mohammad Hanif and Zia Moheyuddin. The crowds for their talks are always overflowing, with gates forcibly shut to prevent further people from entering. It was at one of these events, where Zia Moheyuddin gave a series of readings, that I had the opportunity to have Patras Bokhari first brought to life. Granted, I had been taught some of his stories at school, but all that had left were some memories of an amusing story. However, the lyricism and magic that exist in Patras Bokhari’s writings had been lost one me. His writings feel infinitely better when read, or heard, with the life and vigour inherent in the language used. 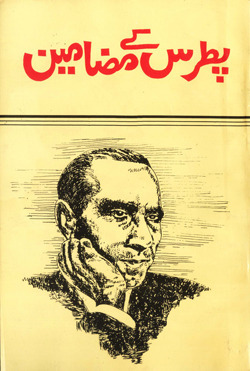 Listening to Zia Moheyuddin’s masterly narration, one gets a far truer picture of the sheer delight that Patras sb seemed to take in his writing, or at least the delight he hoped to evoke. The time I heard Zia Moheyuddin read out Patras Bokhari’s story, he also spent some time talking about his personal experiences of the man, who was one of his teachers at school. It gave me a brief insight into the absolutely remarkable life read by this great author, which is summarised well in this piece by Raza Rumi in All Things Pakistan, which brings up his contributions as much lauded actor, a literary mentor, a broadcaster, a speechwriter for heads of state and a distinguished and celebrated diplomat at the UN. A little known contribution of Bokhari is the survival of UNICEF, which was about to be disbanded after having completed its humanitarian mandate in the WW2 devastated Europe… Eleanor Roosevelt, wife of the US President was the Chief US delegate. Bokhari as the chief delegate of Pakistan was elected to chair the Committee meeting. She read from the prepared US statement given to her, thanking UNICEF for a job well done and proposed its winding up. Bokhari at that point in a dramatic manner stepped down from the Presidents Podium and resumed his seat as Pakistani delegate. He said that listening to Mrs. Roosevelt, he felt that he was presiding over some funeral. He said although UNICEF’s work in Europe may have ended, there were millions of suffering women and children in the developing countries that were in far greater need of UNICEF’s help. This reprimand stunned Mrs. Roosevelt. At the next day meeting of the Committee, she thanked Bokhari and reversed the US position. However, during much of his life, Bokhari was often criticised by his literary peers, who felt he was wasting his talents by committing himself to so many different fields. Raza Rumi points these out. Patras has, however, been criticised for being a man without a vocation and one who did not adequately focus on his literary genius. I was unaware of this image of Patras Bokhari – imagine having Allama Iqbal of all people writing a diss(appointment) track about you! But the more I thought about it, the more I realised something about his place in time and culture. This week, Patari has launched the first of many audiobooks we will be hosting on the site. Our first partners are the brilliant people at Urdu Studio, who have created a vast library of Urdu titles across genres and authors, available as audiobooks. They have spent a long time to create studio-quality recordings of many a great work of literature, bringing together professional voice artists to do the recordings. While Urdu Studio has been a huge success amongst the Pakistani diaspora, they also wanted to find sustainable ways of introducing these audiobooks to Pakistani listeners, which is where we came in. But returning to Patras, the reason we agreed to have him as our first choice was because he was both accessible and yet intellectually formidable. Take this story, Hostel Mei Parhana, which is exceedingly contemporary in its nature. Patras’s account of his life as a university student is full of wicked satire and some marvellous use of language, and yet it is also very universal in its insights and consistently self-aware and self-deprecating. The irony, the self-reflexivity, the moderness are all reasons that Patras’s work translates so well into another medium – audiorecording – as well as for a contemporary audience. Despite the fact that the language used here is regularly ornate, it remains something that people living today can instantly relate to. It makes me think of all his critics, who seemed to be correct in their assessments on Bokhari several decades ago. But what they all didn’t realise was that he was a man both of his time, but also well ahead of it, which is why his genius remains relevant today.